Showing off our finished drawings to family and friends can be gratifying. Enthusiastic viewers appreciate your techniques and may even understand that you spend many hours practicing to improve your skills. But hidden to their eyes is your dedication to doing studies—a most misunderstood aspect of learning to draw from observation. 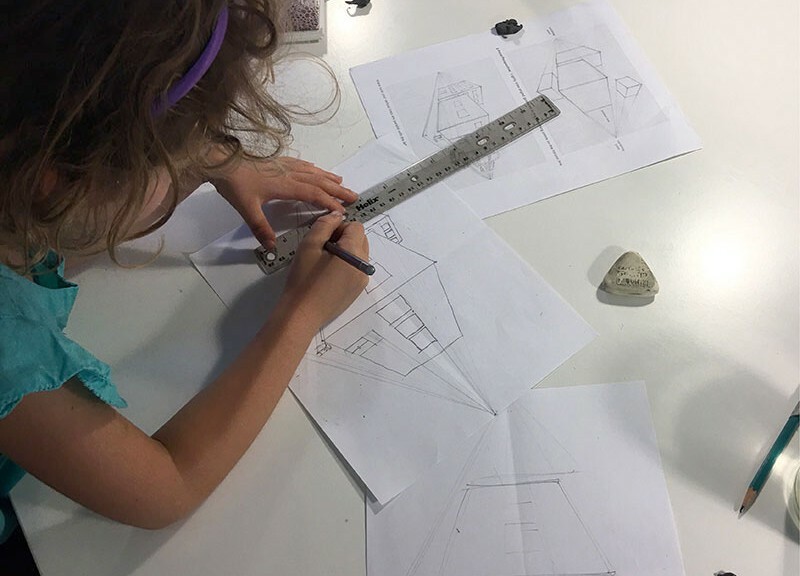 In the tradition of the Renaissance artists, Naomi (shown above) learns the importance of studying as she practices using the system of perspective drawing. 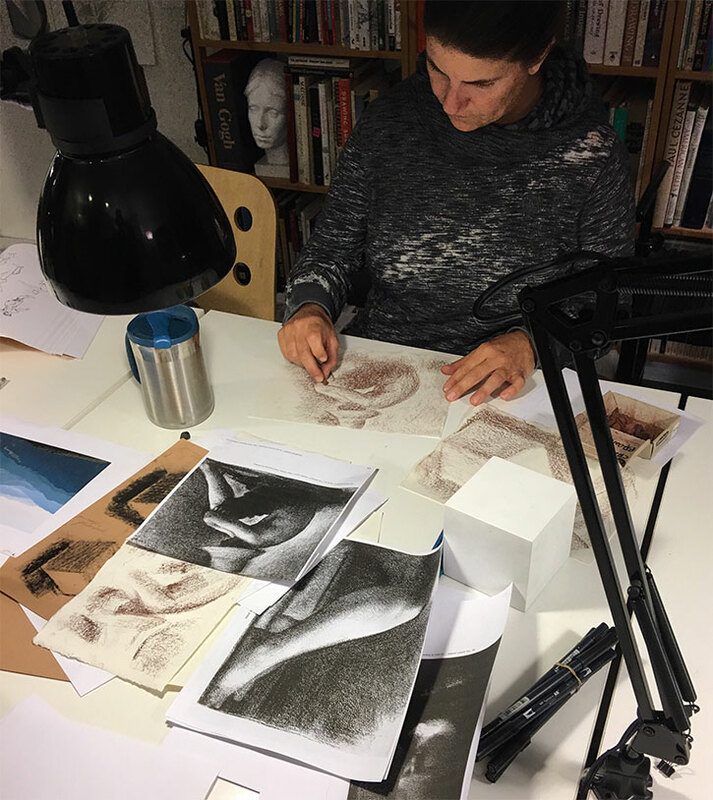 Rachel maps out the contours and tonal values of a still life for her charcoal study. Early Egyptian, Greek, and Italian Renaissance artists and artisans used drawing to study their subjects. They made countless study sketches to solve problems, prepare artwork, and map out elaborate architecture. 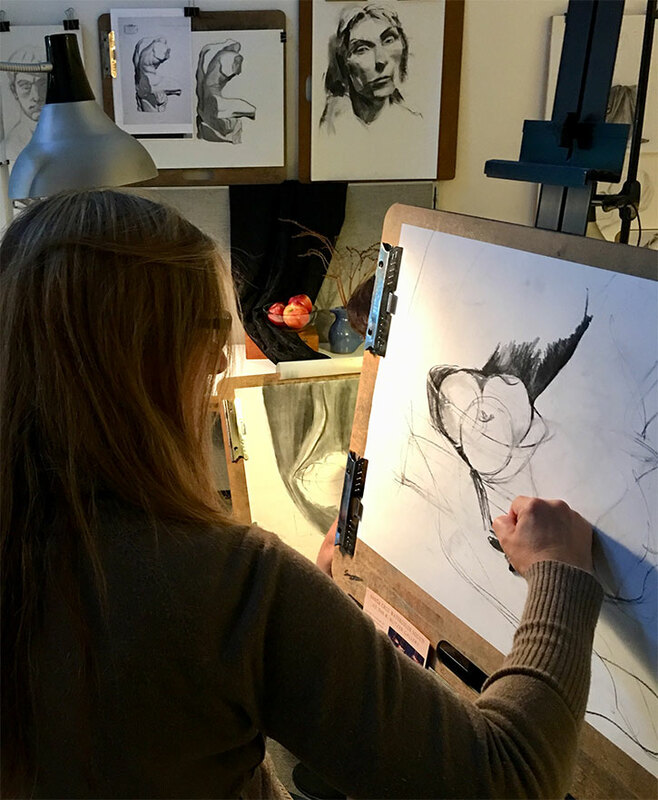 By doing study sketches, students at the Scribbles Institute learn to block in dominant shapes of their subject, sketch accurate contours, and confidently work their way toward drawing final compositions. But as we learn the art of studying, there can also be a lot of “unlearning” during the process. 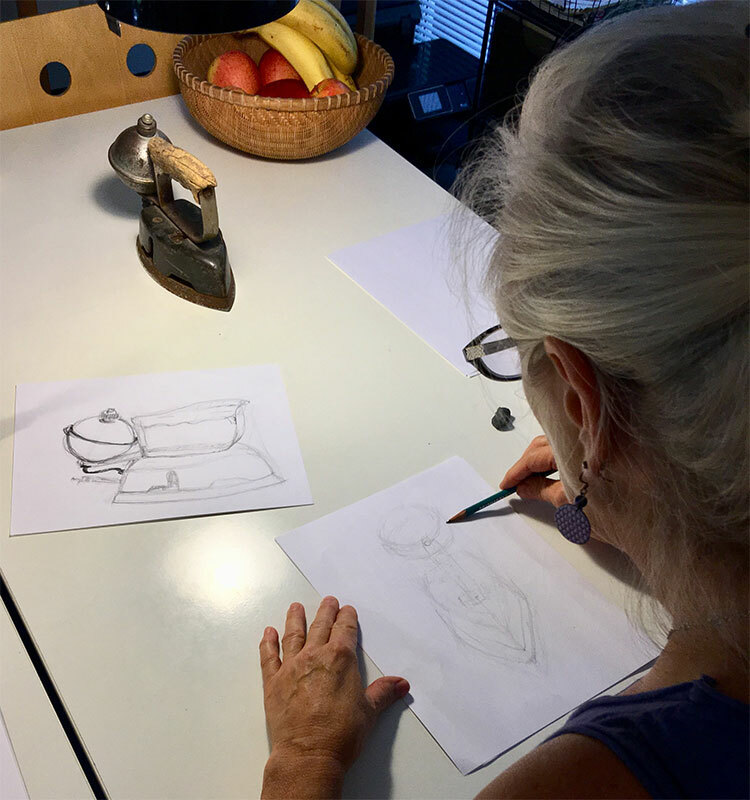 Susan relaxes into her line work as she studies the form and contour edges of an antique iron. During childhood, most of us are conditioned to think pictures need to be drawn perfectly—first time, every time—without error. The notion of perfectionism can actually work against you in your pursuit of successful drawing. But if you get into the habit of doing study sketches, you’ll discover that making mistakes and correcting them is the foundation of drawing accurately from observation. If you have ever had to correct crucial measurements of proportions in the final stages of a drawing, then you know the outcome can be disastrous. Study sketches help you correct mistakes early on, before getting too far along with your drawing. 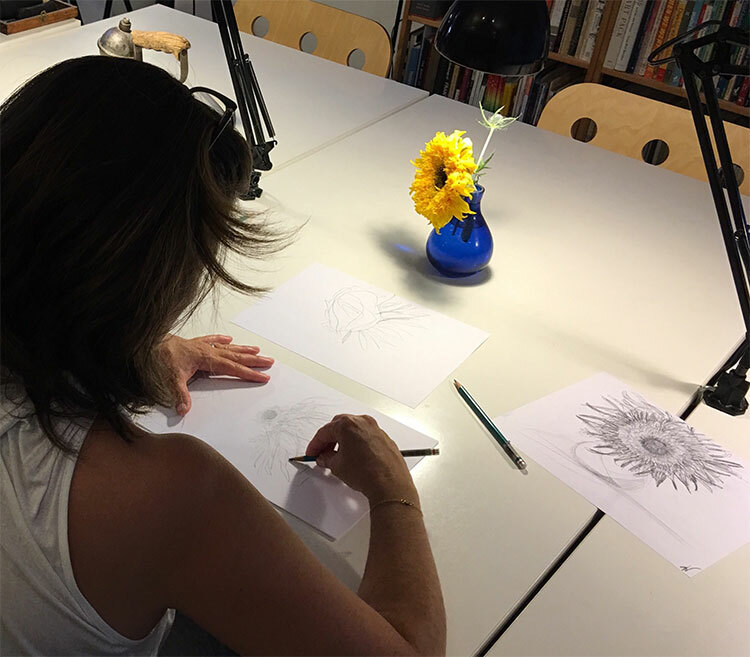 It is in the countless study sketches where you will find accuracy, solutions, and creative ideas as you practice. 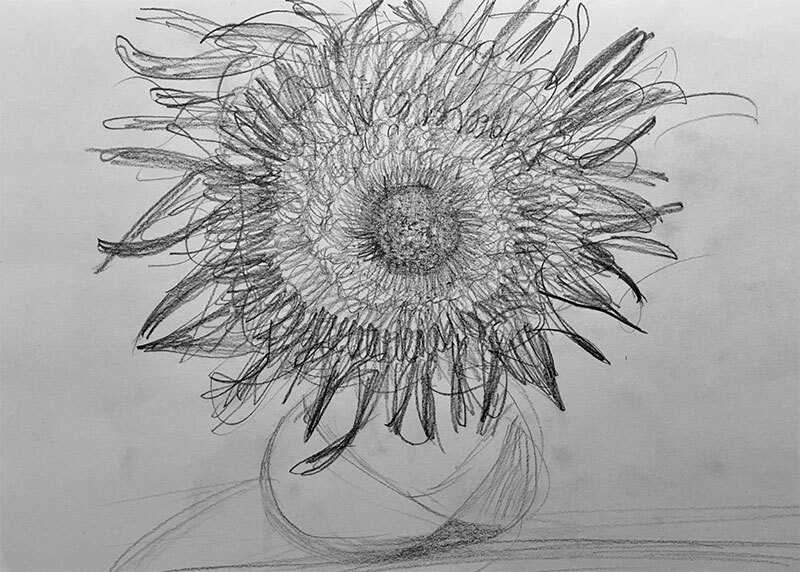 Kimberly’s eyes scanned the intricate patterns of a sunflower; then her drawing hand swiftly followed its contours. Kimberly’s perfectly honest pencil study sketch. Youth sketcher Elijah sketches through reference material from outstanding books by Sarah Simblet and Andrew Loomis. 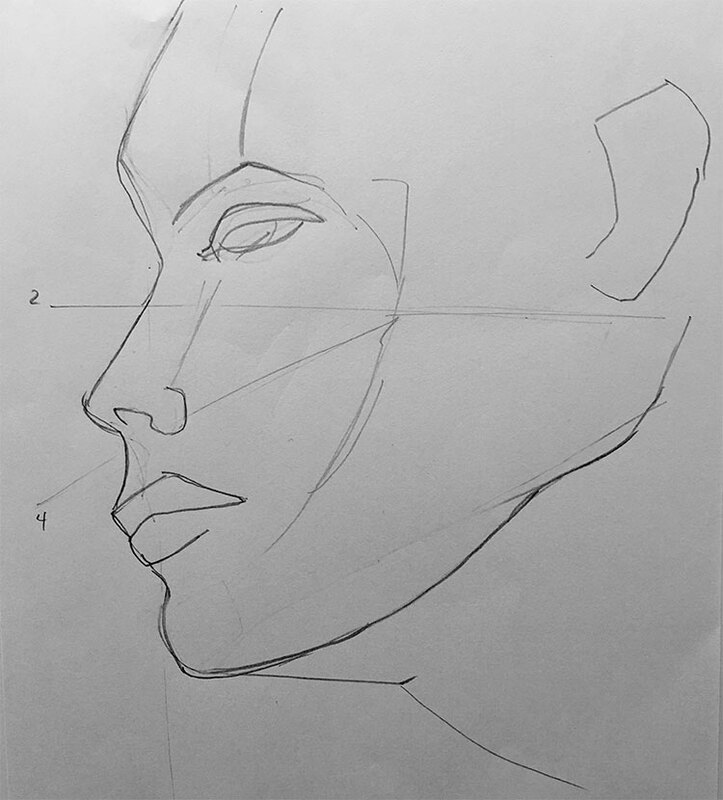 Studies help you grasp complex principles and methods for drawing accurate proportions of the human head and figure. The habit of doing study sketches keeps you from trying to finish your drawing before you even start it. Study sketches show your thinking process on the paper and become a form of note-taking, allowing your brain to process large amounts of information about the subject you are observing. “Note-taking” by adult student Becky as she studied proportions and contour edges from George Bridgman’s book, Drawing from Life. Relax in knowing that an exact replication of your subject is impossible. Lowering your expectations for your drawing to be perfect can raise the level of enjoyment during the process of studying your subject. 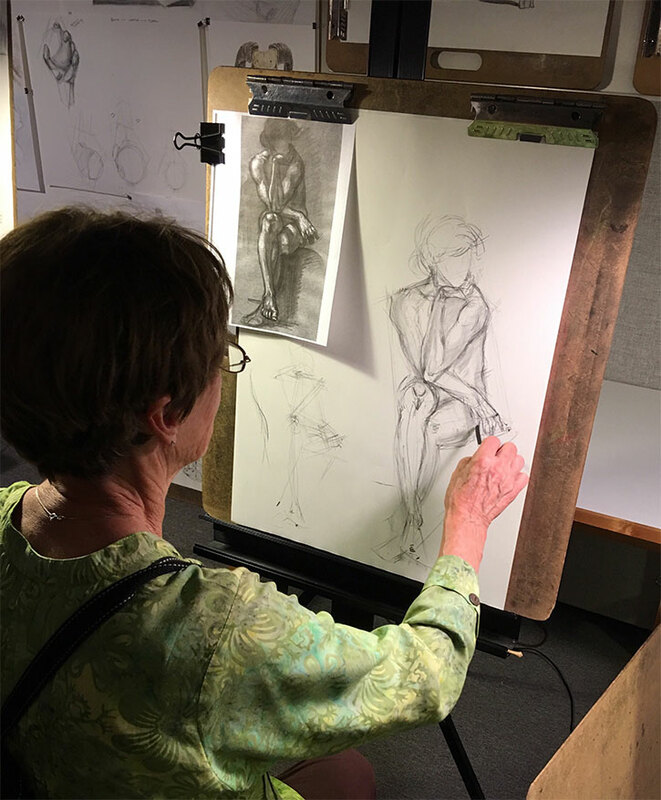 As you refine the accuracy of your study sketches and work toward a final drawing, a clear and honest depiction of your subject begins to emerge. 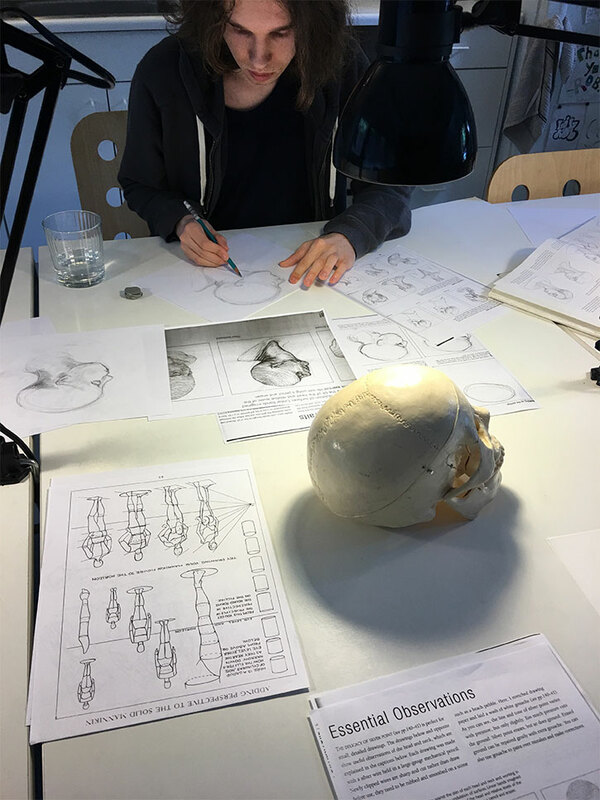 While studying a reference image from Classic Anatomy in Motion by Valerie Winslow, Tina searches for accurate proportions of a figure. Her notes in the lower left of her paper show dominant angles and a constellation of anchor points. This abstract foundation helps her to make decisions for measuring. 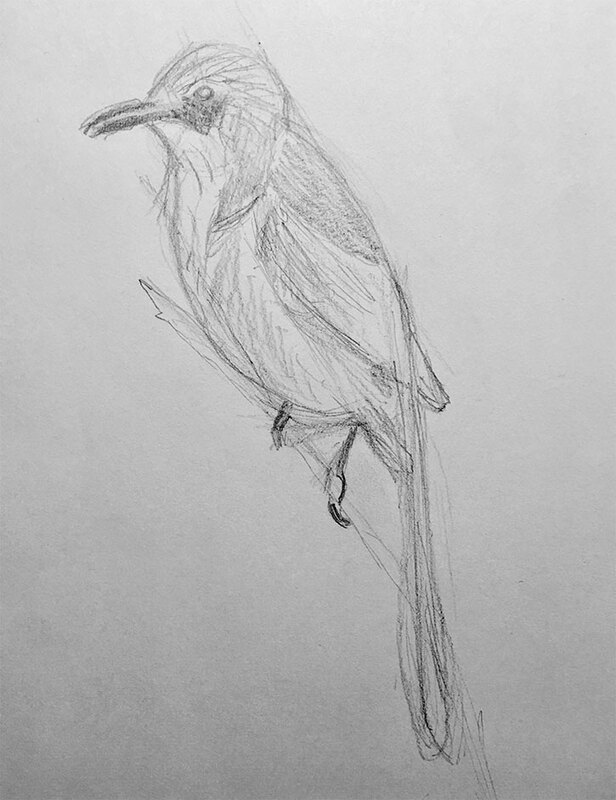 Adult sketcher Cecilie blocked in dominant shapes and angles before refining contour edges and textures of a bird. Notice the delicate balance between light and heavy line work. The deepest level of study happens unconsciously. As your conscious brain guides your drawing hand, your unconscious brain calculates measurements for angles, spaces, and proportions. As you learn to trust your brain’s power to guide you toward the final stages of your composition, your drawing hand will begin to flow effortlessly. 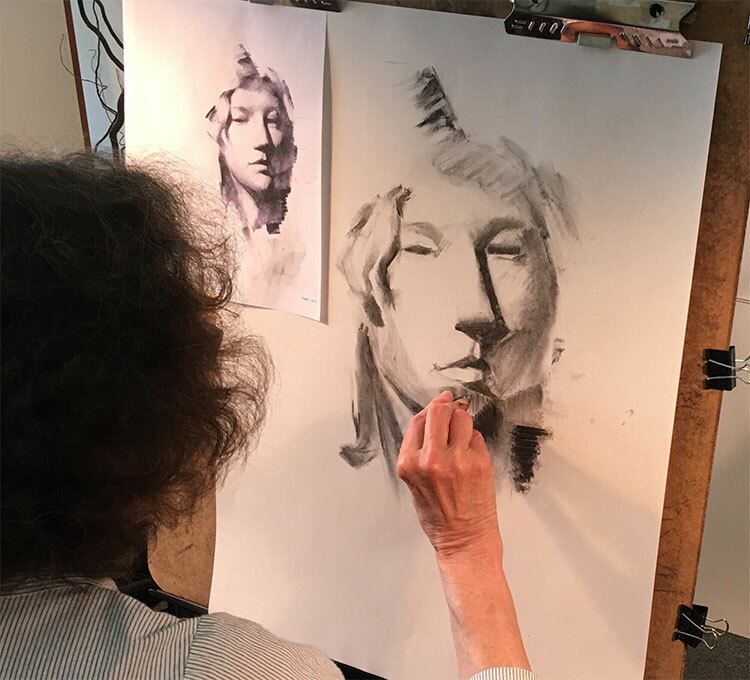 Building upon a framework of accurate measurements, Lenore moves toward a finished portrait while studying charcoal techniques by the artist Mark Tennant. Study sketches help to keep your creativity fresh while exploring different drawing materials and techniques. You will become more productive and develop your own drawing strategies while finding joy in the art of studying. Jamey found pleasure in exploring textured paper and conte crayon as she studied the pointillism techniques of Impressionist artist Georges Seurat. 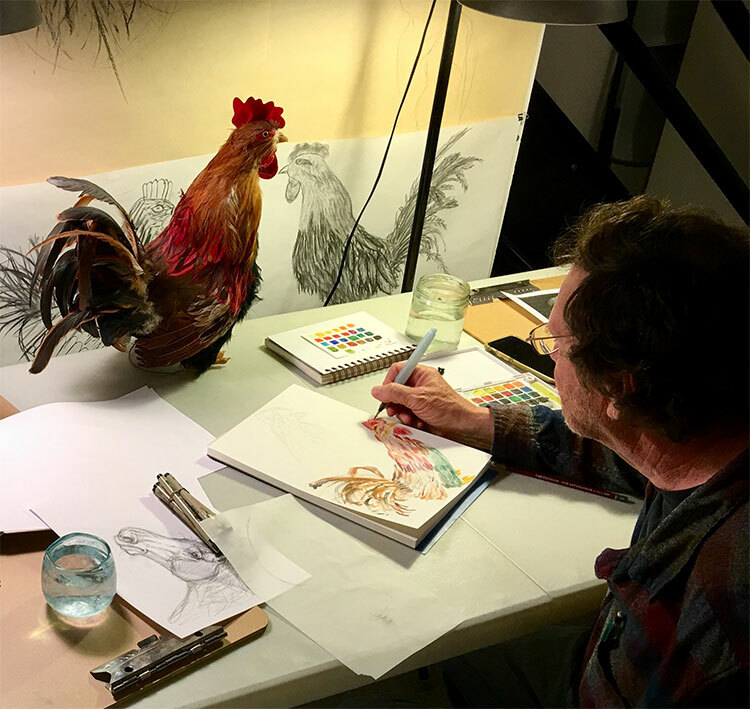 Mike tries his hand at a watercolor study of our studio rooster. 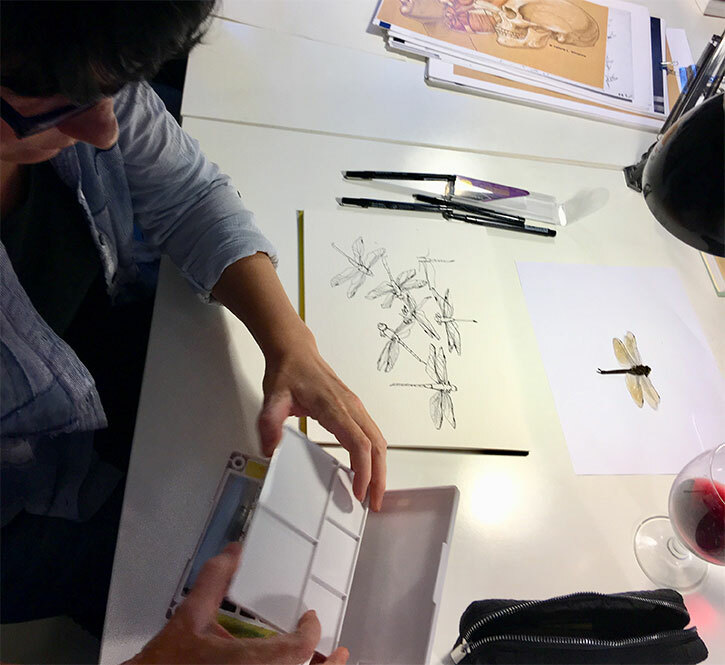 A sizable dragonfly found in the parking lot, outside the studio, provided an opportunity for adult student Inga to study the insect up close during Drawing Lab. 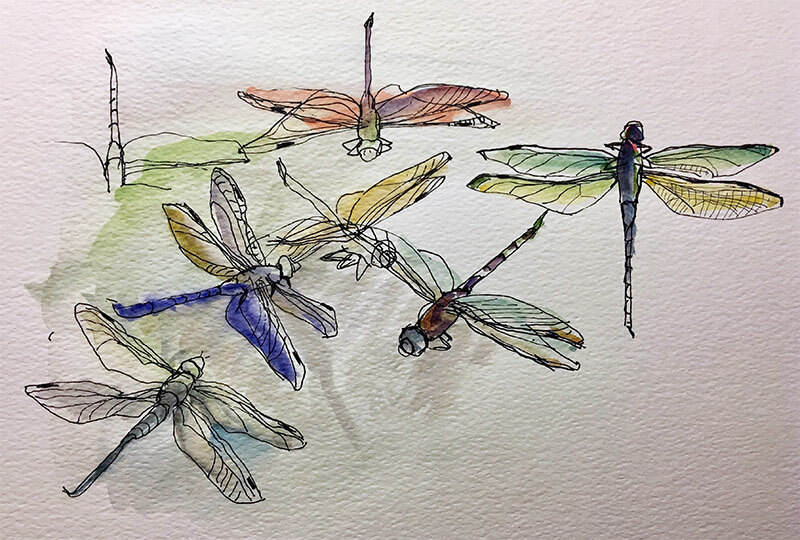 Inga’s gestural watercolor washes and swift ink strokes captured the dragonfly’s essence. Ah, the pleasure of doing study sketches. Previous PostAttack of the Zombies of PerfectionismNext PostWhen the Drawing Gets Tough—Squint!